Delicious recipe for Peanut Butter Cookie Dough Truffles that is filled with Reese’s Pieces! You are going to love these sweet bites of cookie dough! 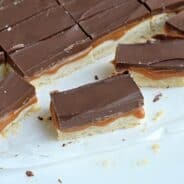 Anyone find themselves baking with the same ingredients? Like going through a phase? Right now I’m in a Reese’s Pieces phase. It could be worse, I could be on a health kick phase! Okay kidding. I NEED to be on a health kick phase. These Truffles are amazing. So good, that once again they had to be shipped off to my husband’s work, where they were quickly gobbled up! There’s no egg in this truffle, so you can gobble as many as you like. They truly taste like peanut butter cookie dough. Then I added the Reese’s Pieces, cause that’s the phase I’m in. Oh, and I dunked them in chocolate and added some peanut butter drizzle. Who could resist??? 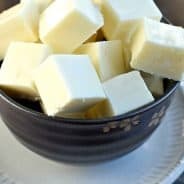 In a large mixing bowl, beat butter with brown sugar and peanut butter until creamy. Add flour and salt. Fold in the mini Reese’s Pieces. 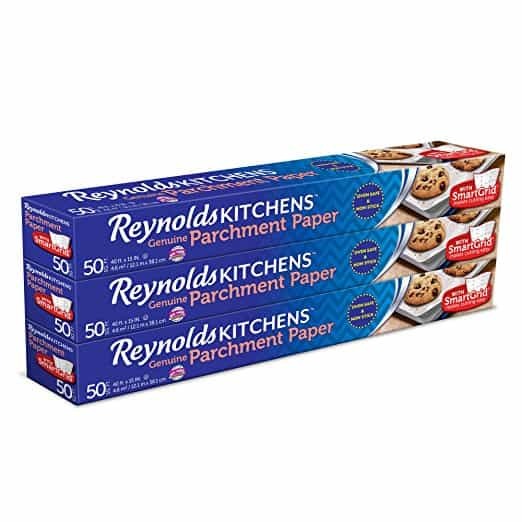 I use a small metal cookie scoop to portion the dough, then I drop the cookie dough onto a parchment paper lined baking sheet. Freeze for two hours. Immediately after removing from freezer, I use my hands to smooth and shape the cookie dough into balls. 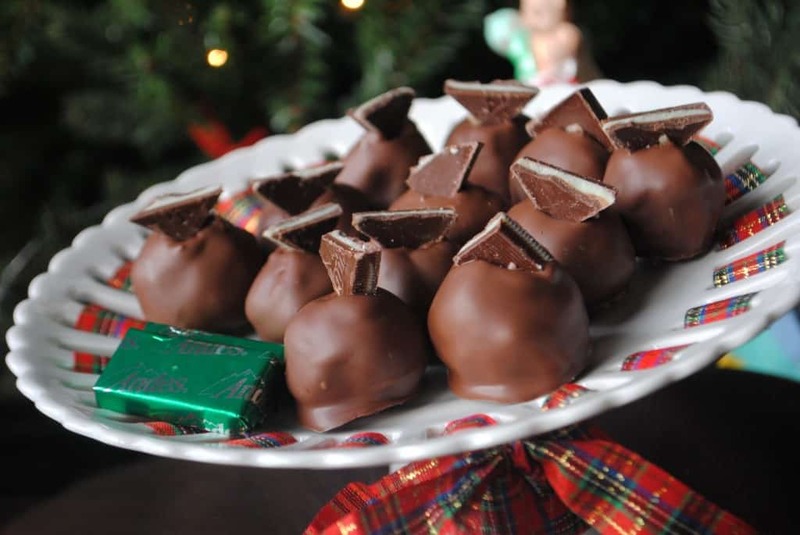 Using a toothpick, dip each frozen truffle into melted chocolate candy coating. Tap on side of bowl to remove excess chocolate. Repeat until all truffles have been coated. In a small bowl, mix melted white chocolate with peanut butter. Pour into a small ziploc bag and snip off the corner. Drizzle over the chocolate coated truffles. Allow to set, about 10 minutes. Store in an airtight container in the refrigerator for up to two weeks. ENJOY! I grew up buying chocolate from Fannie May. 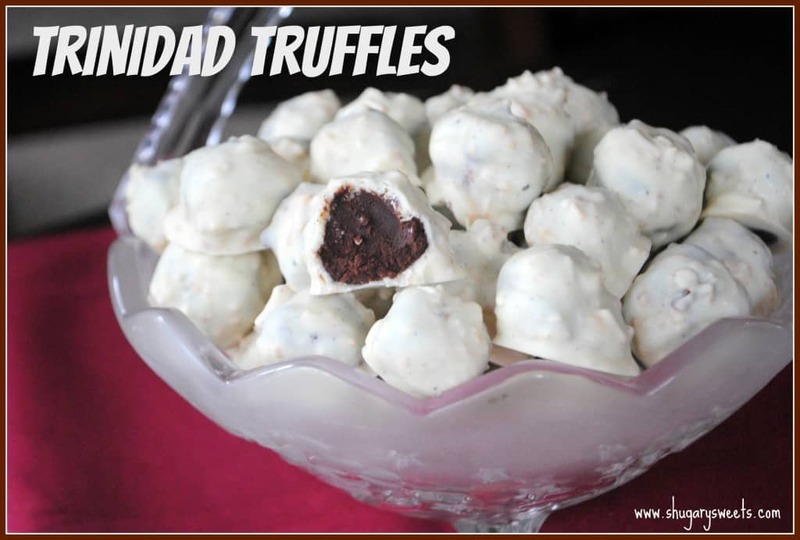 These Dark Chocolate Coconut truffles are copycat Trinidads! YUM. Cookie Dough Truffles are awesome. MINT Cookie Dough Truffles are even better! And of course, let’s not forget about that Reese’s addiction. 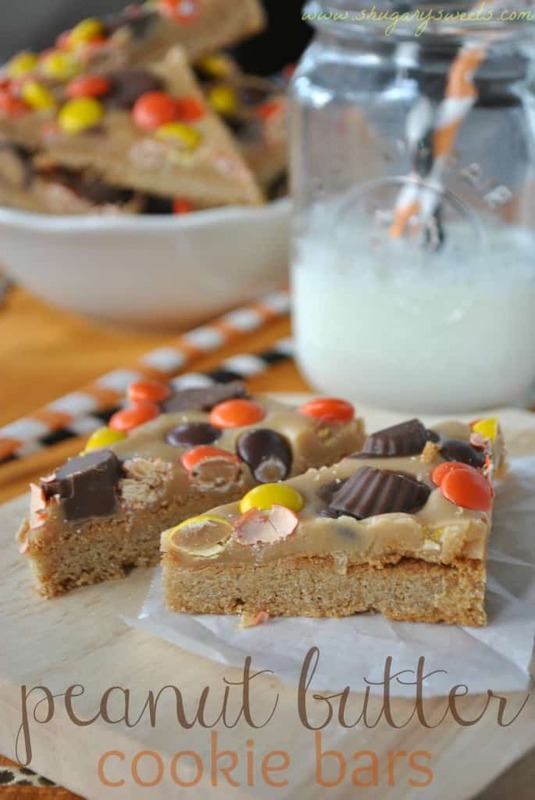 These Peanut butter cookie bars are delicious and decadent! Jocelyn from Inside BruCrew Life made some Peanut Butter Cookie Dough Truffles today too! Our brains tend to be tied together! Look at this Reese’s Poke Cake from Ashton at Something Swanky! OMG get me a fork! These Dark Chocolate Toffee Truffles from Jamie at My Baking Addiction are the prettiest truffles I’ve ever laid eyes upon. Agreed? 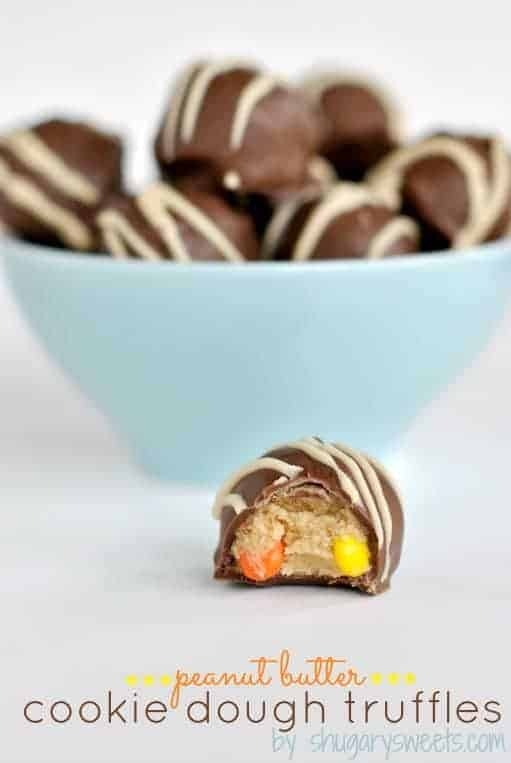 Delicious recipe for Peanut Butter Cookie Dough Truffles that is filled with Reese's Pieces! You are going to love these sweet bites of cookie dough! In a mixing bowl, beat butter with brown sugar and peanut butter until creamy. Add flour and salt. Fold in the mini Reese's Pieces. In a small bowl, mix melted vanilla bark with peanut butter. Pour into a small ziploc bag and snip off the corner. Drizzle over the chocolate coated truffles. Allow to set, about 10 minutes. Store in an airtight container in the refrigerator for up to two weeks. ENJOY! 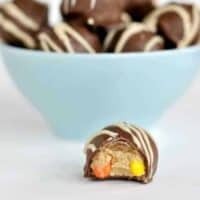 *Today’s recipe for Peanut Butter Cookie Dough Truffles was originally published on Shugary Sweets on May 5, 2013 and has been republished in June 2018. So pretty! I could eat Reeses Pieces all day long! I am right there with you on the Reese’s addiction…I can’t stop! Not that I have tried hard to stop! I would love a bunch of these to snack on today!!! You & Jocelyn must think alike! Haha! Now I have two options for these truffles! Sounds to me like you were meant to make them soon! Cookie dough truffles – these could be dangerous! These are super delish Aimee!! Thanks girl. I find it funny that you made PB truffles too. can’t wait to see your version! These are so pretty – in fact, ALL of them are! 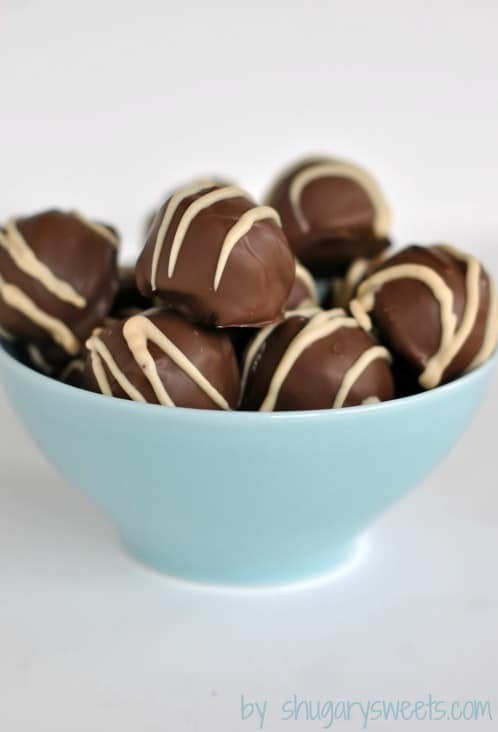 I just love making truffles – I hope to make these very soon. Thanks Kelli, I love truffles too!! I go in phases of fudge…then truffles…then fudge. yes it is Katrina!!! Thanks for stopping by today! YES! They are definitely right up your alley! Oh, you could do it! These look perfect for any peanut butter fan! Love the Reese’s pieces inside!! These look soooo yummy! I was in Bloglovin’ today and I came across both yours and Jocelyn’s recipes side by side and I was wondering if I missed the “Cookie Dough Truffle” holiday! I can not resist!! These look absolutely amazing!! I LOVE cookie dough truffles! These look fantastic! Reese’s Pieces in a truffle? Totally brilliant! These truffles are full of all things good! I could use a couple to get through this afternoon! It’s pretty hard to beat good old chocolate and peanut butter, but I think you did it by adding the element of cookie dough. Well done! They look delicious! 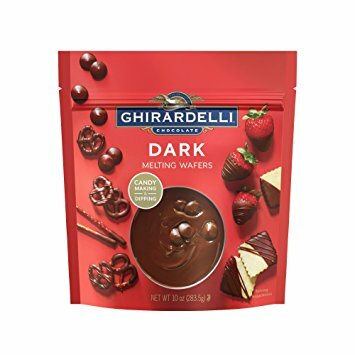 i had one of these last week after a meeting and it was so totally worth blowing my no candy for a month streak. yum! You may have made THE perfect truffle. Delicious. Dang girl… now I NEED these! I love the Reese’s pieces and these truffles are right up my alley! I’ll need a dozen or so! thanks Liz! I definitely have eaten way too many before sending them to hubby’s work! I am glad somebody else shares my reeses pieces addiction! Ooooh these look like they’d be too dangerous to have around the house! omg! how cute are those with colorful reese’s pieces! Aimee, these look insanely good! I think I would eat all of these at once! I would seriously have a difficult time stopping at 1. Or 3. I tested that theory myself. And failed. My hubby would go crazy over these! I need to make them ASAP! Aimee you are killing me with all of your amazing recipes!!! This truffle is all of my favorites rolled up into one! Pinned! Oh wow, these are perfect 🙂 I love the reese’s pieces inside, awesome! I love cookie dough and in truffle form…perfect! Say wha?!?!? These look over-the-top amazing, Aimee!! Can I freeze the truffles before I put the coating on them?? I am thinking of using them on my wedding candy buffet… Want to make some ahead of time if possible. Or can they be frozen after the candy has been put on it?? You freeze them before coating, yes. You can also freeze them after coating them, although sometimes the depending on the brand of candy coating it can change colors. ENJOY. 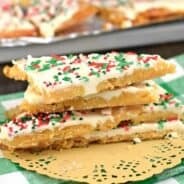 You can make them a week or two in advance and refrigerate them and they will still be delicious! Oh my goodness, these are the BEST!!! I made them for a work function and everyone raved about them! And they are so easy and fun to make! I did have to use mini M&Ms though instead of Reese’s pieces (couldn’t fine them) but they still tasted great with lots of peanut butter flavor. Thank you!!! Reese’s inside? You’re amazing, Aimee! These sound yummy! So excited to make these! Should I use light brown or dark brown sugar? 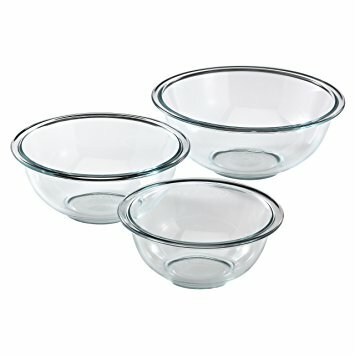 How long and how to store these for gift giving? I have kept them up to two weeks in my refrigerator, in an airtight container with no problems! This recipe takes peanut butter balls to the next level, I absolutely love them!!!! I don’t know too many things better than peanut butter and chocolate! And these sounds totally awesome and I bet totally addictive. I do the same thing you do, ship the goodies off to my husband’s office so I don’t gobble them all down. 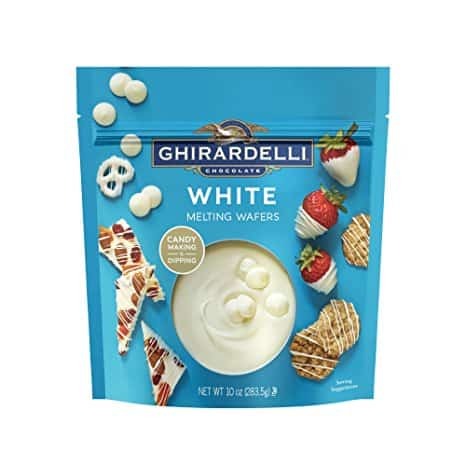 lol These really are the perfect treat for summer! Love the Reese’s pieces in here! They remind me of those Reese’s Pieces stuffed peanut butter cups that you can only get at Halloween! Excited to have a year round option.